Paint Vs. Wallpaper: Which is the Better Home Decorating Option? You are here : Home >> Blog >> Paint Vs. Wallpaper: Which is the Better Home Decorating Option? Life is all about choices. Some we regret and some make us proud! Will your next home decoration project turn out to be dazzling or prove to be a failure? To make certain that the walls of your home look beautiful and stylish, you will have to make quick and strong decisions. The color of the walls, the texture, the budget of the project and many other things will require your attention. But, the very first thing that you need to choose is between a wallpaper and a can of paint. Who doesn’t love to live in a beautiful home that reflects their personal style and beauty? But, you have to decide by considering all aspects and not only the emotional factors. Let’s take a practical approach and make a wise decision. Every wall is different and you need to consider the prep work required for your home before making a decision. If the wall is brand new, the decision becomes fairly simple. You just have to follow your gut. On the other hand, does the wall have a coat of paint or wallpaper on it? In case of a removable wallpaper, the work will be almost negligent. But, traditional wallpaper may take some time and expertise. And, if you need to remove existing paint from the wall, it can mean striping of the paint with a scraper or a liquid paint stripper which is time-consuming and a messy affair. they make installation quick. If you are inclined to paint a room, remember that paint is not forgiving. Any problem with the wall will be easy visible. So, choose the paint option if you are ready to spend an additional day on repairing the wall and making it perfect. When it comes to upfront costs, paint wins the race. Wallpapers are known to be expensive because of their versatility and requirement of professional installer to do the job. On the other hand, a few paint cans do not cost more than $15-$30 per gallon. An average-size room may require two-three gallons of paint. It means your material cost will be less than $100. But, it doesn’t mean that you should discard the idea of wallpaper. A high-traffic zone may require lot of paint touch-ups and increase your cost. In the long run, wallpapers are more durable. So, make a well-thought decision. 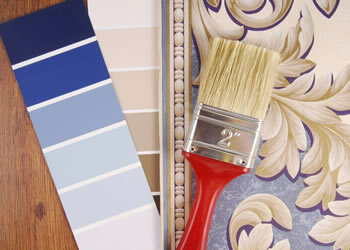 If you choose an expensive paint or wallpaper, the cost can quickly increase. So, consider your budget and available options in the market. In the olden days, homeowners preferred wallpapers so that they could experiment with different textures and add a dimension to the walls. It was an easy decision. If anyone wanted simple walls with solid color, they preferred painting them. And, if someone was looking for prints, stripes and designs, they purchased wallpapers. But, with wide availability of modern paint colors and innovative techniques, you can use paint to create diverse designs. Nowadays, big painting companies have a team of color consultants and artists who can create any design and paint unique patterns and scenes that depict garden, beach, sunrise or anything else to suit your desire. 1. If you are allergic to paint fumes and they cause severe headache and nausea, consider choosing wallpaper. Avoid painting your home unless absolutely necessary. 2. If you live in a humid climate, wallpapers can give you more problems than pleasures. The adhesive may lose its power and the wallpaper may come out. 3. Wallpaper can last for many years if you protect it from tears. Paint doesn’t need that kind of attention but you need to redo the painting work every five years. 4. If you are using quality paint, cleaning it will become easy. You can find many waterproof, eco-friendly home paint brands available in the market. 5. Painting a wall can take time because you may need to apply multiple coats. Alternatively, installing a wallpaper is quick and easy. 6. If you are going to change your home soon, opt for removable wallpaper that you can take with you whenever you leave. 7. Wallpaper is not ideal for kitchens and bathrooms as the steam and water will ruin the paper. 8. If you live in a rental home, you may not be allowed to paint the walls. So, discuss it with your landlord. 9. No matter what option you choose, high personalization means big expenses. Only the Best for your Home! In conclusion, wallpaper and paint are both great decorating options for your home. With modern innovation, you can obtain them at affordable cost and still enjoy impressive results. Consider your requirements, calculate your budget and then make a choice. No matter what option you choose, do not cut corners. Trying to opt for cheaper material will not give you the desired results. And, if you are confused about making the decision, remember hiring professional painters saves cost. Choose a reputed home painting company who has experience of painting as well as installing wallpapers. Consult the experts and make the right choice for a beautiful home. Are you confused about wallpaper and paint? Or have you made the decision? Perfect Painter is a trusted home painter of GTA. We can help you with wallpaper installations as well home painting projects. Whether it is painting a kitchen, bathroom or any other area, our crew can finish the work on time and guarantee beautiful results. Get in touch today. Removable Wallpaper: Is the Peel-and-Stick Option Right for You? How to remove Old Wallpaper and give a New Look to your Home? Whether you require interior or exterior work, our professional team of designers, painters and restorers can address problem areas in your residential or commercial space. © Copyright 2019, PerfectPainter.ca - Top Rated Toronto Painters. All Rights Reserved!